Although every person's experience of loss and grief will be unique, Lee points us all to the God who never forsakes us - our heavenly Father who is able to comfort and sustain us even through the greatest of losses, and who offers the only true hope in the face of death. 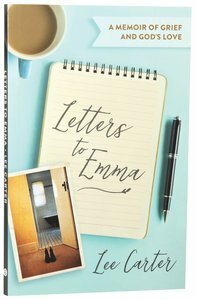 About "Letters to Emma: A Memoir of Grief and God's Love"
Customer Reviews For "Letters to Emma: A Memoir of Grief and God's Love"
Grief is often brushed over as people can be uncomfortable with emotion. Lee Carter's book opens the doors on the rawness of grief in a way that unlocks the pain and gives others permission to be honest. Throughout the book Lee also converses with God who walks with her in the shadow of death, has conquered death and gives great hope for the future.